Within the SEEurope project a number of case studies are being undertaken focusing on the question of worker participation within newly established European Companies. The research teams in general are composed of researchers from different member states. 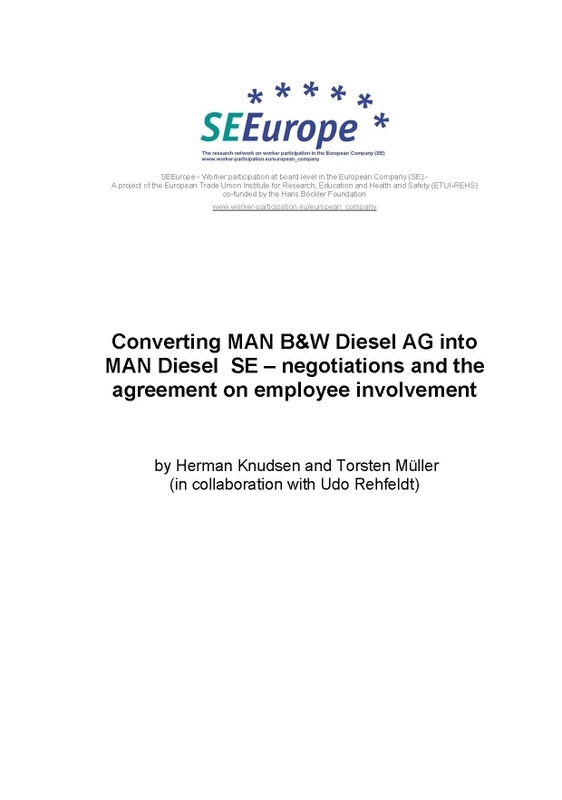 This is the expected effect of the agreement on workers’ involvement in the future MAN SE, one of the leading manufacturers of commercial vehicles, engines and mechanical engineering equipment, concluded in February 2009. Around 49,000 MAN employees in Europe will henceforth have the opportunity to oversee management decisions through their representatives in MAN SE’s supervisory Board, whose composition is based on parity of workers and shareholders’ representatives, something that previously only German employees enjoyed. Initially, four German representatives and one each from Austria and Poland have been appointed to represent the European workforce in MAN SE’s highest-level monitoring body. Employees from GFK, a Germany market research "knowledge based" type company, are to enjoy the benefits of increased employee board-level representation following the decision by the German based company to organise itself under the European company statute. The company currently employs 6,500 workers across 23 European countries and hitherto has not had an established works council of trade union representation. The agreement was reached with the assistance of the European Trade Union Institute. Strabag was a pioneer in realising the new opportunities provided by European legislation. The SE legislation came into force on 4 October 2004 and Strabag SE was registered in Austria on 12 October 2004. In accordance with the law, an agreement on future workers’ involvement was presented to the court of registration. Although heavily criticised, at least by the German and Belgium building workers’ trade unions, SE registration was accepted. Strabag was the first major company operating cross-border in Europe – and also to a considerable extent in the new member states – which accepted the obligatory board-level representation of workers by maintaining the existing two-tier system. Today, 32 per cent of the company’s employees are in the new member states or candidate countries such as Croatia and Serbia, all of whom are covered by the agreement. Strabag SE opened up a new chapter of workers’ involvement for these workers in particular. MAN affiliate MAN Diesel SE, founded in August 2006, made history as the first SE. As a result of this, German codetermination was spread to other EU member states: on the SE supervisory board the German workforce representatives now share the 50 per cent of the seats formerly reserved for them in accordance with German codetermination law with their colleagues from Denmark. No less important, the SE works council is now much more European than the previous European Works Council. This Europeanisation of interest representation to the highest achievable extent is well in line with the objectives of the European Metal Workers Federation (EMF). 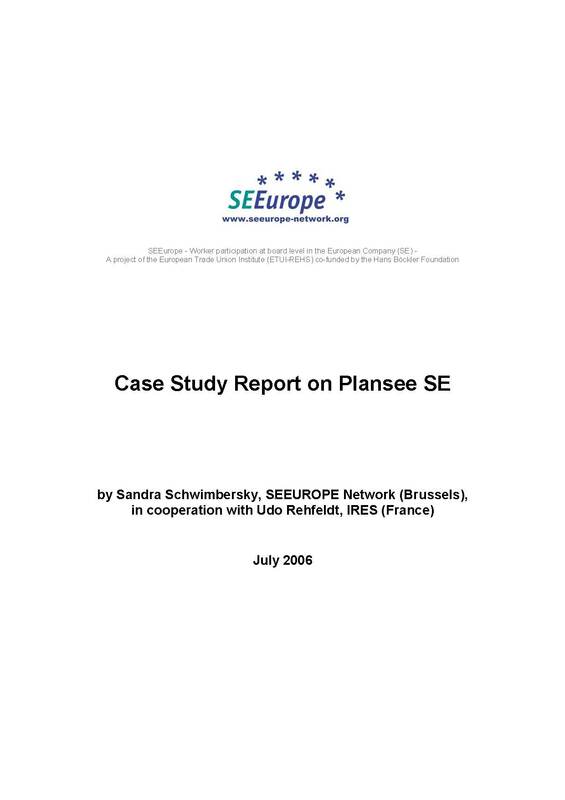 The aim and purpose of this study is to track the process of transformation of Plansee AG into an SE and the views of the different parties involved, namely the management and works council of the company, the relevant trade unions and the Vienna Chamber of Labour. Besides giving a timeline and describing the process of transformation from different viewpoints, the study presents an analysis of results. However, evaluation of actual working practice is limited to the period of 5 months since the transformation took place. Finnish-owned Elcoteq opened a new chapter of high company mobility and flexibility in Europe by taking advantage of the SE legislation. But its employees are dependent on cross-border information and consultation only somewhat above the standard provisions. 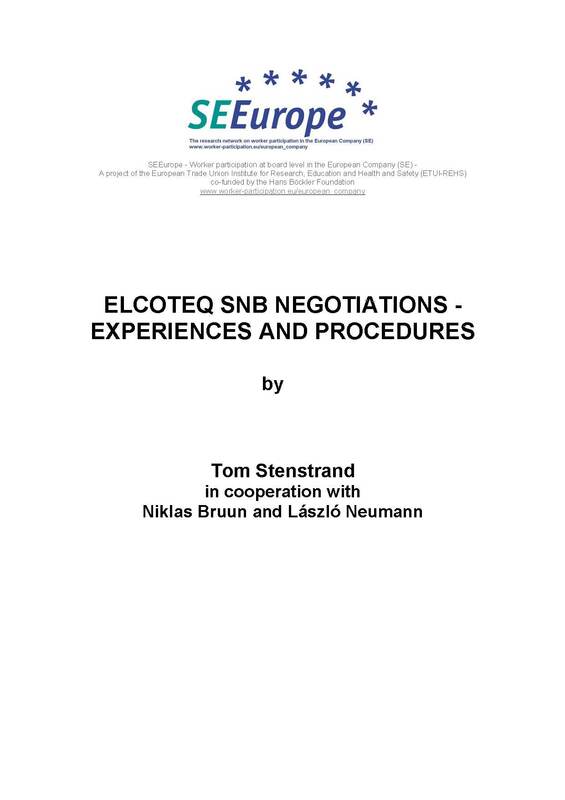 No board-level representation has been introduced by negotiating workers’ involvement in Elcoteq SE. Since 2005 the ETUI has been regularly issuing information on registered SEs which is supplied by its SEEurope research network. Since July 2008 the information is accessible via a specific online database. The ECDB delivers key data to facilitate observation and analysis of developments on European Companies.